I will try and promise that this is my one release date/calendar rant of the year, but I will try and make it count for something. Here I will discuss the release path of Labor Day and some issues with the film calendar that it illuminates. Now as this link indicates the film debuted on August 29th at the Telluride Film Festival. This release date is close to when its ideal release window should be. I know that in my initial 61 Days of Halloween posts I jested about how Labor Day as a cinematic holiday is about as significant as Arbor Day. And, historically speaking, that’s about right. There isn’t an over-abundance of films set around the time, and at the end of the day all the fete really means is a long weekend, the last vestige of summer. Therefore, it is more useful as a backdrop than a theme, but it does serve this story well and signify a specific time of the year to a North American audience. 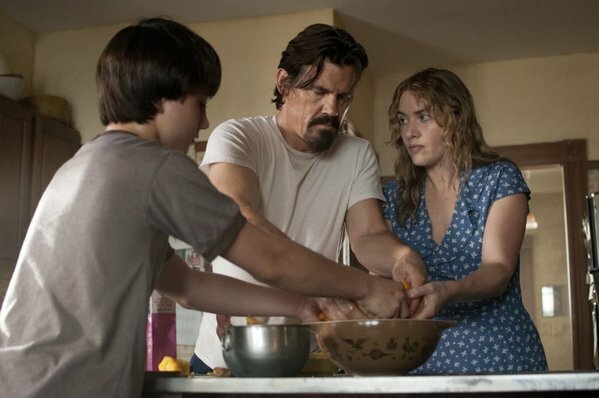 The initial release date for Labor Day was announced as December 25th. Surely, that created some internet snickering, but as per the Hollywood code it indicated some confidence in the film. Although, it was a seasonally incorrect choice. However, cramming your releases in at Christmas is what you “have to do” if you believe your film is an award contender. Here is my diatribe on the tyranny of release dates. 47 Ronin, Believe, Wolf of Wall Street, Grudge Match, The Secret Life of Walter Mitty, Mandela: Long Walk to Freedom (Expanded). When all was said and done this awards season only The Wolf of Wall Street made significant noise but it was ultimately shutout on Oscar night. Eventually, the plan was for Labor Day to open in a limited Oscar-qualifying run on 12/27 and to open wide on January 31st. On the 27th Lone Survivor and One Chance opened in limited release. It opened against That Awkward Moment nationwide. That all would make it seem like it was an advantageous move marketing-wise. Less crowded weekend, plus the fact that January is usually a landing site for junk, or properties studios do not know what to do with, boded well for a nation-wide expansion of an Oscar hopeful. As of today Labor Day has not made its production budget back at the box office. The Rotten Tomatoes isn’t great (http://www.rottentomatoes.com/m/labor_day_2013/) but audiences flock to things in droves that critics slam creating terms like critic-proof. One attribute that frequently affects releases in the fourth and first quarter of the year is weather. The east coast is a large proportion of the movie-going public and when it wasn’t snowing in January it was cold and about to snow. So nothing lit up the box office like The Devil Inside did. Not that that’s hard scientific evidence, but it never helps overall numbers. Buzz has to be deafening to draw the crowds out nothing woke the masses up this year until The Lego Movie came out. The Oscars are a big money-grab. They cost money and they, ideally, render you money. The end-of-year qualifying didn’t grab any attention. A Golden Globe nomination for Kate Winslet isn’t going to get butts into seats. No one cares. No one knows who the Hollywood Foreign Press is or what they say. What does all that amount to? Essentially the studio seemed to scramble. They wanted in to the year end fray to try and grab some holiday money and garner some accolades. What wasn’t taken into account, aside from narrative-appropriate release was the fact that the times they are a-changing. Long-delayed films in this Internet age are no longer getting the kiss of seat. Films are delayed for many reasons. The fact of the matter is, you’re unlikely to change how the Oscar and other award machinery works. The Academy and the studios are all complicit in making that work the way it does. However, the fact that 67% of those polled claimed to have not seen a single best picture nominee on Oscar night should concern everyone in the industry. The idea isn’t just bragging rights, guys. That and Labor Day weekend, while usually not offering huge box office takes, is a soft spot in the annual schedule seeing as how the “fall films” aren’t quite ready to bow and August is the no-man’s-land of the summer schedule. For example, last year’s long-holiday winner was The One Direction movie with nearly $16M not a huge number but if Labor Day could’ve gotten that opening weekend it’d be in a different boat considering its relatively modest budget. So I don’t think a delay would’ve hurt, I don’t think a tie-in with the actual date the story is set-on would hurt. Valentine’s Day and New Year’s Eve were mostly-asinine ensemble romcoms but still managed to win the box office mostly on timeliness. Even stupid holidays are things people would rather think about on said holidays rather than when they know they’re gonna freeze when they get back out of the theater. Lastly, and a complete other story entirely, more same date VOD should start happening for titles that aren’t expected to rake in Frozen or Iron Man 3 like amounts of cash. The above-listed films are the only, I repeat, only films nominated for Academy Awards in any category that were released prior to the month of October. Forget the fact that two of the most well-received films of the year were Mud and Fruitvale Station released in May and July were absent from Awards season. There are many things that The Silence of the Lambs accomplished that will never occur again: it was a film that built-up momentum over the course of weeks, but it also a February, yes, February release that went on to Best Picture. Memories now are too short, perhaps by choice but part of the game, which is annoying is that you can’t release titles in the first three-quarters of the year and hope to garner nominations. The studio had some faith in Labor Day and because it held on to that glimmer of hope it put itself in a disadvantageous position financially. Part of the reason, aside from award consideration, that a title like Labor Day can land in late-December/January is that seasonality, with regards to film releases is not as much of a consideration anymore. This is both a good and bad thing, the good thing is that if you’re a horror fan (as I am) you can expect horror films year-round. However, during my doubly-long focus on horror there were few theatrical wide-releases I could focus on and featured an indie VOD title as well. With that example, and a more reason instance of Free Birds being available to rent or buy now despite its obvious tie to Thanksgiving there was less hesitation about pushing Labor Day into award season I’m fairly sure. A decision I feel ultimately hurt more than it helped. For in January if you’re not a purveyor of junk or catching up on Oscar fare you’re usually not seeing much, you’re recovering from Christmas more than likely. Another negative of the current film game is that studios and the Internet have ensured that opening weekend becomes more and more important. Studios slotting release dates for titles that are two to three years from fruition are now news. Similarly, so are shifts in release date. The award shuffle is ultimately not worth the effort a lot of the time. Films that debut in that time frame and don’t get the notice they want end up being buried and lost, perhaps losing an audience they had a chance to get at a different time. An example would be Monuments Men, which bowed out entirely and has made upwards of $100M worldwide. I don’t even have an opinion about it anymore. Every movie I’ve ever done was released in November or December until Moonrise Kingdom, which opened in May. It did better than any of my films had done in ages. It seemed like it helped that it didn’t come out in the middle of all this stuff [awards contenders]. It didn’t round up all kinds of prizes, so why not be released in May? And we weren’t finished with Grand Budapest in time to come out last year. I would not have wanted to try to rush it out. At the same time, I’m very happy not to wait 10 more months to release it. And Berlin seemed perfectly suitable, since we filmed the movie in Germany.